There are surprisingly few documents from 1969 that mark the birth of the internet. We have some notes scribbled on a pad of paper, and a few newspaper articles after the fact. But there weren't any reporters parked outside of 3420 Boelter Hall at UCLA on October 29, 1969 to witness that historic moment when the ARPANET gasped its first breaths. In fact, it wasn't even above-the-fold news. This lack of media interest isn't terribly surprising, but it somehow feels strange with the benefit of hindsight. The world was about to get a whole lot smaller, but very few people understood that just yet. However, one of the few (newly digitized) artifacts that we do have from this era includes a tiny article in UCLA's student newspaper, The Daily Bruin. 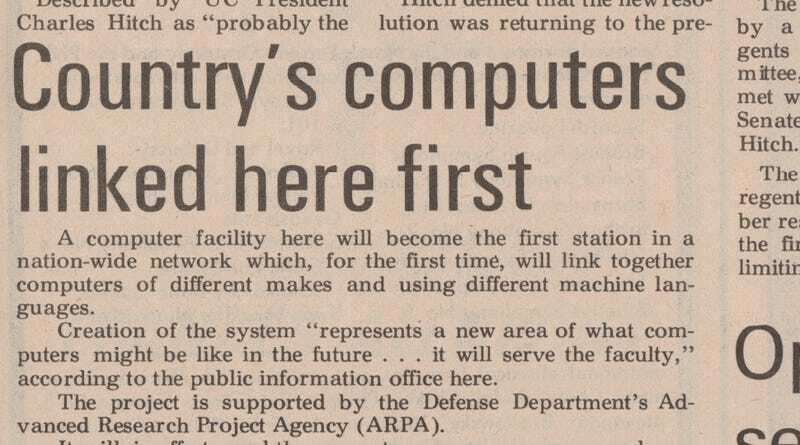 "Country's computers linked here first," read the headline from the July 15, 1969 edition. The article briefly explains that work was being done at UCLA on a new network and that it should be up and running by the following year. The piece also quotes Leonard Kleinrock, an internet pioneer whose early work on queuing theory would contribute to the basic technology that allows the internet to function. Many thanks to Simon Bensoussan, a research associate at UCLA's Kleinrock Internet History Center, who sent me this newly digitized artifact. It's a fascinating little piece of history, and one of those things that makes me want to get in a time machine and yell at people from the past: "You have no idea how big this is going to be, people!" You can read the article in its entirety below. A computer facility here will become the first station in a nation-wide network which, for the first time, will link together computers of different makes and using different machine languages. Creation of the system "represents a new area of what computers might be like in the future . . . it will serve the faculty," according to the public information office here. The project is supported by the Defense Department's Advanced Research Project Agency (ARPA). It will, in effect, pool the computer power, programs and specialized know-how of about 5 computer research centers, stretching from here to M.I.T. Other California network stations (or nodes) will be located at the Rand Corporation and System Development Corporation, both of Santa Monica; the Santa Barbara and Berkeley UC campuses; Stanford University and the Stanford Research Institute. The first stage of the network will go into operation this fall as a subnet joining UCLA, Stanford Research Institute, UCSB and the University of Utah. The entire network is expected to be operational in late 1970. "The processed work is shuttled back and forth until B is satisfied with the photo, and then sends it back to Computer A. The messages, ranging across the country, can flash between computers in a matter of seconds," Kleinrock says. UCLA's part of the project will involve about 20 people, including some 15 graduate students. The group will play a key role as the official network measurement center, analyzing computer interaction and network behavior, comparing performance against anticipated results and keeping a continuous check on the network's effectiveness. Each computer in the network will be equipped with its own interface message processor which will double as a sort of translator among the Babel of computer languages and as a message handler and router.